Today in forex trading the GBP strength caused strong movements on many pairs. The GBP/JPY had a buy signal on The Forex Heatmap®, along with several other GBP pairs showing great quality trading signals. The British Pound to USD exchange rate also soared today. News from the GBP about the claimant count employment data along with average earnings triggered the strength in the GBP today, and all GBP pairs we follow had technical and price breakouts. Based on today’s news we expect the GBP to continue strengthening. The real time buy signals from The Forex Heatmap® are shown below along with some of today’s GBP price chart movements. The GBP/JPY should continue higher to the 162.00 resistance area, and the GBP/AUD has significant upside on the larger time frames. The Forex Heatmap® provides live buy and sell signals for 28 currency pairs, it is an easy to read tool for guiding all of your forex trade entries. Forex traders can use GBP news drivers on the economic calendar to locate strong price movements. Traders can capture these movements and profit from them with the techniques we will demonstrate. This article will show any trader how to track these volatile GBP (British Pound) pairs and we will also show you a great indicator set for trading these pairs. Forex traders should become familiar with the world economic news calendar. The calendar can be customized to show GBP news events or news events for any other currency they like. Some examples of scheduled GBP news announcements that create volatility in the GBP pairs are: Consumer Price Index, Core Consumer Price Index, Bank Of England Interest Rate Decisions, BOE Asset Purchase Target, Manufacturing PMI, and many others. These economic news drivers are scheduled and traders can watch the market after these news announcements for trading opportunities to buy or sell the GBP pairs. If you need a world economic news calendar to track GBP news events we have one on our website. These handy calendars will also provide you with scheduled news drivers for other important and most actively traded currencies. Now that you know how to look for scheduled GBP news, and what time these economic news announcements will be. The next thing you need to do is determine how to enter trades on the GBP pairs when they move up or down after the news. We trade 28 pairs at Forexearlywarning, and 7 out of the 28 pairs are GBP pairs. These pairs are all quite volatile. The EUR/GBP is the low volatility pair in the group, and the GBP/NZD is hyper volatile. If all 7 GBP pairs moved 1% in one day, the total movement on all 7 GBP pairs would be around 1000 pips on the day this article was written, and it used to be much higher before the Brexit vote. Some forex traders almost cannot believe it, but this type of volatility makes the GBP pairs group the most volatile group of most commonly traded pairs. The opportunity is here to make a lot of pips and the volatility makes it possible. On April 4, 2016, the GBP (British Pound) had a scheduled news driver on the economic calendar, it was the GBP Manufacturing PMI news announcement. The net result for traders was that the GBP weakness dominated most of the market movement after the news announcement. The GBP was weak on all pairs on this day and pairs like the GBP/JPY, GBP/CHF and GBP/AUD all sold off hard. The trading signal you see below is from The Forex Heatmap®, which provides live buy and sell signals for the GBP pairs and 7 other currencies. It provides live trading signals during forex market hours and after all forex news drivers across 28 pairs. As you can see the GBP was weak on this day after the GBP news announcements and this drove strong price movement. 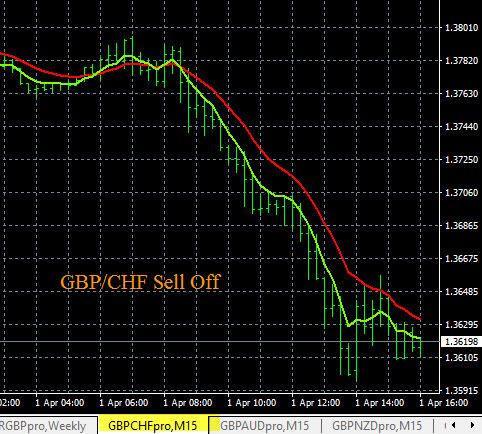 Also, an example chart of the GBP/CHF sell off is also shown, you can see this pair alone sold off 175 pips. The GBP pairs as a whole moved much more than 1000 pips in one trading session on this day. If you combine the trend, GBP news economic drivers, and The Forex Heatmap®, you can start to build a powerful trading system. On this day the GBP/JPY was in a long term downtrend and it also dropped on the GBP weakness. We estimated on his day that the GBP/JPY should continue down to at least the 158.50 support level on the H4 time frame, or possibly much lower. The GBP/AUD broke out to the downside and this pair resumed the downtrend on the W1 time frame, withthe next major support is at 1.8350, so additional pip potential is available on the GBP pairs. The live heatmap signals will give you a profitable trade entry, but if you are trading with the major trends and breakouts you can start riding the trends lower on these pairs and add to your pip totals. The GBP pairs are naturally more volatile, but less volatile pairs can become much more volatile after scheduled news divers, or other unexpected worldwide news events. Pairs that are less volatile become much more volatile after news events, as logn as one currency is consistently strong and the other currency in the pair is consistently weak. We track 8 currencies including the GBP pairs with our indicators. Following all 28 pairs and 8 currencies is fairly easy, and when combined with our alert systems and the economic calendar, you will always be in the know when currencies are moving. Today in forex trading the AUD (Australian Dollar) was strong and the GBP (British Pound) was mostly weak. The GBP/AUD had a strong sell off. See the live trade signals pictured below. The GBP/AUD is trending down on the W1 time frame and it should continue down to the 1.9350 support zone. So any sells today will have additional pip potential beyond today’s movement. 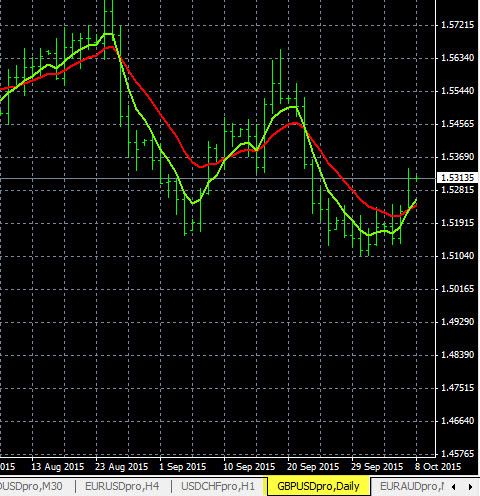 The AUD/CHF also had a buy signal and a strong movement higher. The trade signals you see below are from The Forex Heatmap®, which provides live signals for 28 pairs. The snapshot below is of the AUD pairs, but the heatmap also gives live signals for seven other currency groups in an easy to read format. Today in forex trading the GBP pairs had a buy alert on the Forex Heatmap®. The GBP (British Pound) was strong and the commodity based currencies like the AUD, NZD and CAD were weak. Therefore, the The GBP/CAD, GBP/ AUD and GBP/NZD all had strong moves to the upside. The GBP/AUD and GBP/NZD moved up, but these pairs are not really in trends so these look like short term moves on the smaller time frames. However, the GBP/CAD is trending up and should continue higher to the next resistance at the 2.0900 area. Today’s visual trading alerts from The Forex Heatmap® are shown below. The heatmap gives traders live buy and sell signals for 28 pairs and is a visual map of the forex market. 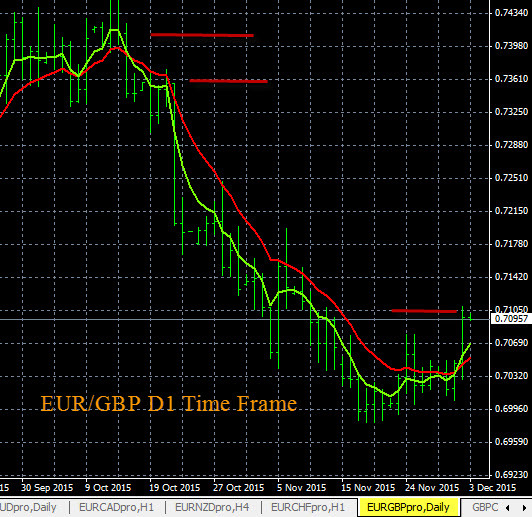 This chart shows the D1 time frame uptrend that has formed on the EUR/GBP. Traders can set a price alert at at 0.7110. When the alert hits check The Forex Heatmap® to confirm any buy trades. Upside pip potential is up to the 0.7400 area which is noted by the red lines. These trend charts are exponential moving averages set up on a metatrader platform, any forex trader can set up these trend indicators for all 28 pairs we follow in just a few minutes. We also have some short videos that show you various metatrader setup options for building these trend indicators, like our basic setup, shown below, and other trend chart setups using metatrader profiles. 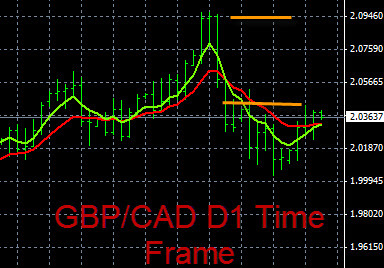 The GBP/USD D1 time frame is forming a new cycle, the current resistance is 1.5330. You can set a price alert here, when the alert hits look for a buy signal on The Forex Heatmap® to verify any buy entries. GBP and USD news drivers are tomorrow in the main trading session. This pair forming descending tops and bottoms chart pattern so scale out lots on any buy entries. The trend indicators you see below are exponential moving averages set up on multiple time frames. Today in the forex market the GBP/JPY had a sell signal on The Forex Heatmap®. This pair sold off strong to just above the 184.00 support level. We would scale out lots at this price but it could continue lower and has additional room to drop on the H4 and D1 time frame to the next support level. The AUD/JPY also dropped today and this pair should continue down to at least the 82.50 support, and possibly much lower since this pair is in a strong downtrend. The sell signal for the GBP/JPY is below, this is the Forex Heatmap®, it gives live trading signals for 28 currency pairs. You can see that the GBP (British Pound) was weak today and the JPY (Japanese Yen) had some strength, creating a scenario for a strong sell off on the GBP/JPY pair. This profitable trading system for 28 pairs is available from Forexearlywarning.com. 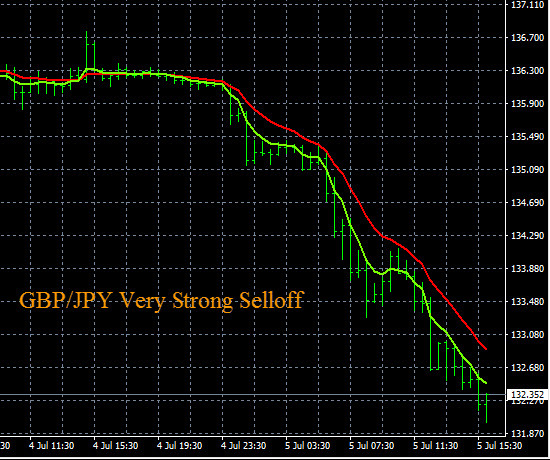 Today in forex trading the GBP/JPY had a buy signal on The Forex Heatmap®. This pair cycled up to the 187.00 area resistance, we would scale out some lots at this resistance area. The GBP/USD also moved up strong and this pair has no nearby resistance, it should continue higher on the D1 time frame. 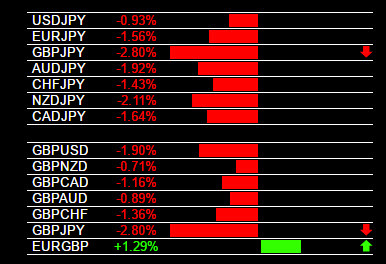 Check the signals below, the GBP (British Pound) was strong on all 7 pairs and the JPY (Japanese Yen) was mostly weak. 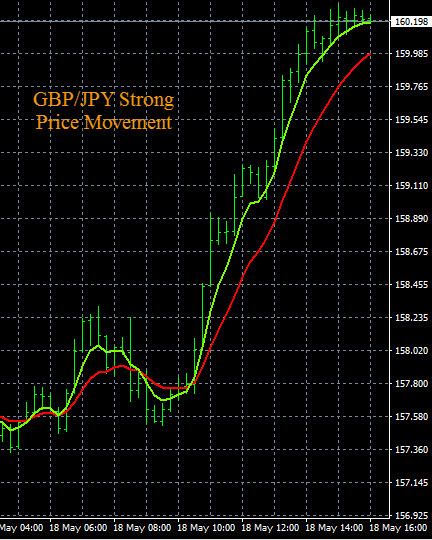 This creates conditions for strong movements on volatile pairs like the GBP/JPY. The Forex Heatmap® provides live buy and sell signals for 28 currency pairs, and is part of our highly profitable trading system. The GBP/CAD is trending up on the larger time frames, line the MN time frame. This pair has sold off on the D1 time frame but is now reversing back up into the main trend. Traders can set a buy alert at 2.0440. Above this price look for a buy signal on this pair in the main session using The Forex Heatmap®. This pair has some near term resistance up to the 2.0440 area, but past there this pair has potential to the 2.0950 area. This is around 500 pips of overall potential. Check the larger time frames like the MN time frame to verify the longer term uptrend. The trend analysis charts you see below are exponential moving averages we give to our clients.